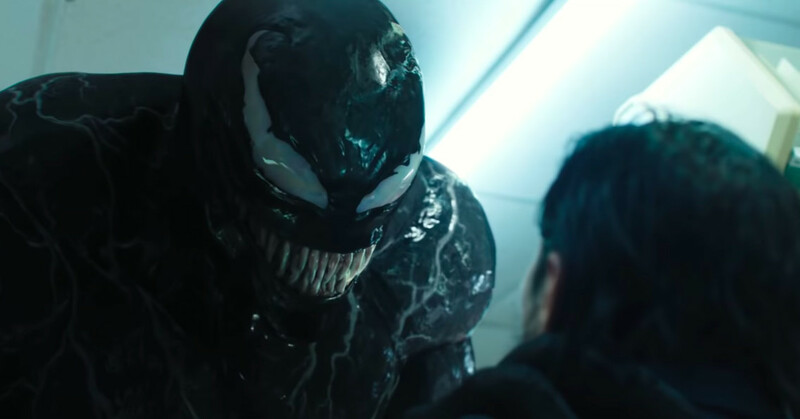 Like its lead character, the film "Venom" feels like it has two separate distinct personalities within it. But unlike its lead character, the film fails to fully merge into a cohesive whole. While the film turned out to be a solid and fun experience, there's this sinking feeling that the film could have been so much better than the final version. Eddie Brock (Tom Hardy) is a hard line reporter known for his no-holds-barred exposés. But when Brock decides to take down the notorious Life Foundation scientist Carlton Drake (Riz Ahmed), his whole life is destroyed in an instant - losing his job and even his fiancé, Anne (Michelle Williams), in the process. Months later, Brock finds his opportunity to reclaim his previous life when a scientist that is connected to Carlton Drake gives him the evidence he needs. While in the Life Foundation premises, a symbiote merges with Brock and he suddenly has incredible superpowers but this comes at a cost. Twisted, dark, unpredictable, and fueled by rage, Venom leaves Eddie wrestling to control dangerous abilities that he also finds empowering. As Eddie and Venom need each other to get what they’re looking for, they become more and more intertwined. Once the action started rolling, "Venom" became extremely awesome. But the film took its sweet time to introduce Eddie Brock's character spending its first half explaining his origins and his motivations without much symbiote action taking place. While we understand the reason why, it significantly affected how the second half of the film played out. If the first half was very meticulous and very detailed in its presentation, the second half felt a little too sloppy. If the first half was somewhat slow and boring, the second half was fast-paced with balls-to-the-walls action sequences. This is the biggest issue we have with "Venom" - it never felt cohesive or even complete. In connection to this, the screenplay was just so-so and rather cliché and predictable. Even Brock's main antagonist, Carlton Drake, is a rich billionaire with little or no morals. Who hasn't seen that before? What really saves "Venom" is the character Venom. The dynamic between Eddie Brock and Venom was captured well on the big-screen. With Venom's booming and monstrous voice and top-notch effects, the character of Venom is scary and surreal. These portions of interplay between the two not only ramps up the action but brings in a lot of the appeal, comedy and, fun that the film heavily rides on. Overall, "Venom" is a solid superhero film. It definitely lacks polish and it doesn't reach the heights and appeal of the MCU films. But this is a darker and grittier experience that is a fun one when the film decides to showcase its lead character in full form.